In the spare wing of a church-run sanatorium, some zealous youths create "the Library," a space where lonely citizens can read one another’s personal diaries and connect with like-minded souls in "dialogues across the ether." But when their scribblings devolve into the ugliest confessions of the macabre, the Library’s users learn too late that a malicious force has consumed their privacy and their sanity. As the city of Turin suffers a twenty-day "phenomenon of collective psychosis" culminating in nightly massacres that hundreds of witnesses cannot explain, the Library is shut down and erased from history. That is, until a lonely salaryman decides to investigate these mysterious events, which the citizenry of Turin fear to mention. Inevitably drawn into the city’s occult netherworld, he unearths the stuff of modern nightmares: what’s shared can never be unshared. An allegory inspired by the grisly neo-fascist campaigns of its day, The Twenty Days of Turin has enjoyed a fervent cult following in Italy for forty years. Now, in a fretful new age of "lone-wolf" terrorism fueled by social media, we can find uncanny resonances in Giorgio De Maria’s vision of mass fear: a mute, palpitating dread that seeps into every moment of daily existence. With its stunning anticipation of the Internet—and the apocalyptic repercussions of oversharing—this bleak, prescient story is more disturbingly pertinent than ever. 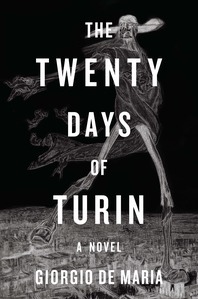 Brilliantly translated into English for the first time by Ramon Glazov, The Twenty Days of Turin establishes De Maria’s place among the literary ranks of Italo Calvino and beside classic horror masters such as Edgar Allan Poe and H. P. Lovecraft. Hauntingly imaginative, with visceral prose that chills to the marrow, the novel is an eerily clairvoyant magnum opus, long overdue but ever timely.